If you're not already aware, broken spots in the routing is what causes Freezes and Lags in your game, as explained in Game Help:Intermittent Freezeswiki FAQ. To permanently solve this, the routing need to be repainted over in Create-A-World. This is the result of that exercise. You can find the full guide on how to use this in Game Help:World Routing Lagswiki. So, here is the IslaParadiso.world file with the FIXED Resources imported, for people who don't want to mess with files in S3PE. 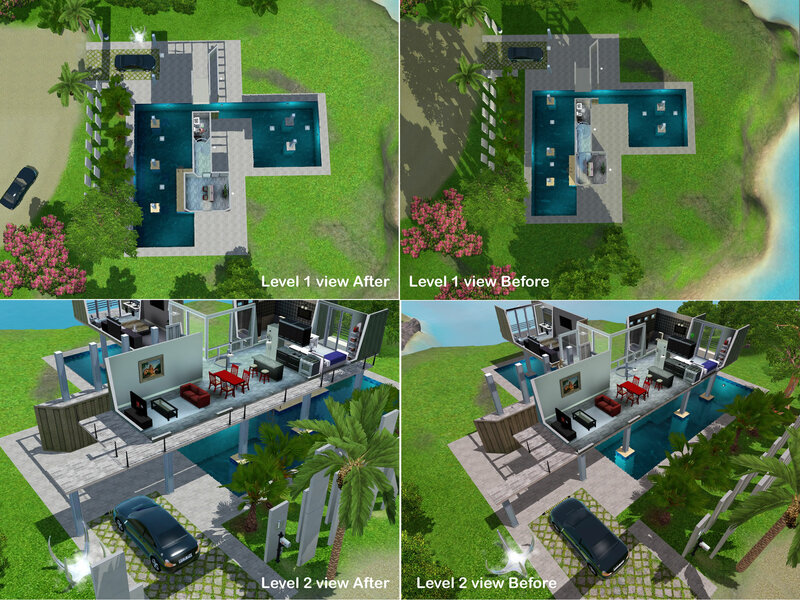 Some Before and After images that you can use as Visual Indicators on how to check if the world file is the original or fixed version. At the Floating Fotress houseboat: bathroom re-arranged. At Port Pleasant: rocks and plants re-arranged. For a more comprehensive list of things done, please read this download thread Resources for IslaParadiso.world's various Fixes for ALL of the problems that were addressed; that were reported to me. It might even be worthwhile to take the time to read the Comments of that thread, especially if you encounter issues, just so you can check if it has been discussed and addressed before. If you encounter more routing issues that have not been addressed in this fix, do please report it on either of the IslaParadiso threads' comments section. Do bear in mind that not all routing or lags can be corrected in a world fixes. Download all parts of the world, and rename them to get rid of the "MTS_ellacharmed__" portion. 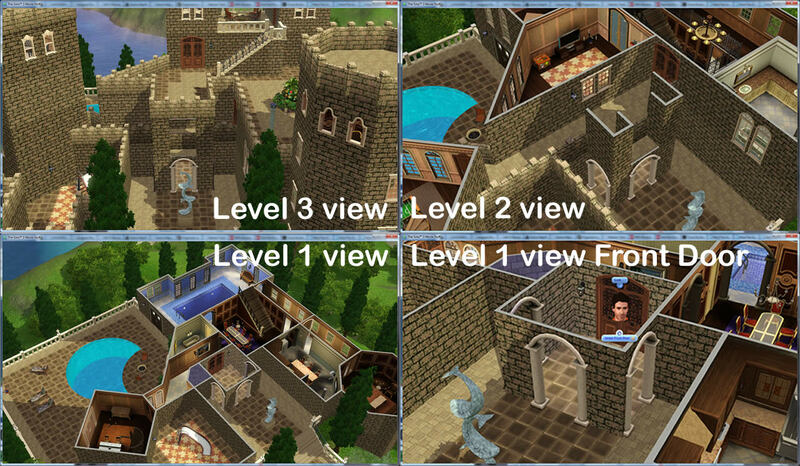 See Game Help:DFDD4 Download the File#Content with Multi-part fileswiki with pretty pictures. Just in case, but not really necessary, as per past experience with EA's patches. Delete the *.world file. 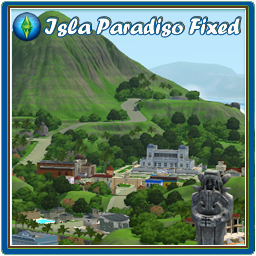 Or if you want to reuse it after patching, rename it with a ".fixed" extension, so the filename becomes "IslaParadiso.world.fixed"
Nov 29, 2013 update: More updates, with reports from MeestorMark’s post from carl-sims’ forum (link in MTS IP fixed world thread), supplemented by reports from Trickai from post#28 onwards. Alto Household. Toilet on 2nd floor with the zebra double doors had the 2 walls torn down and door replaced. Dregg Household. Front door set. Rodel Household. Front door set. Front of Lot set. Teeny bit of tearing on edge with main road. Lot nudged a teeny tiny bit in CAW, Conformed Edges and so now terrain and Road has to be included in fixes file. Rabbithole. Also teeny tiny bit of Lot tearing on the side connected to road. Was originally nudged in the first version of fixes, but now each time I use EIG and export the edited Lots, the terrains that have been nudged appear to have bigger gaps in the tear. Gaps also started appearing in the adjacent sides. Community Lot – Resort. One of the spiral staircases doesn’t appear to work, has been rotated. The other one appears OK.
Community Lot – Resort. Fences surrounding the trees on the 2 islands removed. Made while on Patch 1.57. Would most likely be compatible with any patches in the future as well, as EA has never ever modified a .world file in any of the patches. No multi-parts. Please feedback any issues on this thread as I log in to MTS more often than on Wordpress. This is an experiment; if the account gets flagged for high traffic and exceeds the allowed bandwidth, I have to take it down. So please do download from MTS as a first choice. The bandwidth stats are recycled at the beginning of each calendar month. So, when the bandwidth is exceeded, please download from MTS, or wait until next month. Disregard the above. Full .world upload is now on Google Drive, no sign in should be required. Q: When I try to download, I get a 403 error. If you get a 403 or 503 error, means that you're downloading too many files at one time and are using up all the download slots. There's a limit of 3 files at a time or 3 chunks per file per downloader to give other members a chance. You'll have to wait for six hours when the server reset its caches for you to be able to download again. Q: When I try to extract, I get an error. A: Have you read the DFFD5 wiki? Have the files been renamed? If yes, to both questions, post with the filenames after the rename action and the exact error message, please. And also state what archiver program you use? Q: Why don't you upload it as a single file, and avoid all that hassle? A: There's a file size limitation onsite. If none of the above answers help, the file is also available on my blog @ellacharmed.wordpress.com. Please feedback any issues on this thread as I log in to MTS more often than on Wordpress. Q: My game crashed when I load my Isla Paradiso Save game. A: Well, you need to start a new Isla Paradiso game. If it still crash on a new game with the caches and worldcaches deleted, please post in comments with the information asked for below. if you're getting an error when downloading and it is not the 403/503 error explain above, state the exact error message, and how many times you have tried downloading; and if you haven't given it some time to try again later? Babele44 and the gang who posted on the Unroutable sims thread, bigfeef, MeestorMark’s, Trickai all who provided very detailed reports. DFDD5 Extract from Archive#Multi-part files.